"Star Wars" isn't the only factor propelling the toy and game maker's stock. Can its outperformance continue? Shares of toymaker Hasbro (NASDAQ:HAS) returned a scorching 19.7%, including dividends, in the first quarter of 2016, which is equivalent to an annualized return of nearly 80%. Meanwhile, the broader market, as proxied by the S&P 500, returned a meager 1.4%. Rival Mattel (NASDAQ:MAT) also had a great quarter, returning 25.3%. Both companies have been on a roll recently, with Mattel's total return of 57.5% for the one-year period through March 31 besting Hasbro's 31.2%. Mattel's stock price rise was largely driven by an uptick in Barbie sales over the holiday quarter, as well as hope among some investors that the two companies might merge after it was revealed earlier in the year that the companies had been in merger talks a while back. Hasbro, however, remains the longer-term winner. Its three-year return of 101% far outpaces both the broader market's 40.4% return and Mattel's negative 11% return. Why has Hasbro stock been red-hot in 2016? And can its outperformance continue? Hasbro holds a license from Disney (NYSE:DIS) to produce Star Wars-themed toys. So its results for its third quarter and, especially, fourth quarter of 2015 got a huge boost from the phenomenal success of Star Wars: The Force Awakens, released in mid-December. Hasbro's movie-based toys were among the best-selling items of the holiday season. These toy sales were a significant factor in propelling Hasbro's fourth-quarter revenue to a year-over-year increase of 13% (23% on a constant-currency basis), and its adjusted earnings to a year-over-year rise of 13.9%. (We don't know exactly how much revenue Star Wars merchandise contributed to Hasbro's coffers, as it doesn't break out its revenue by franchise.) 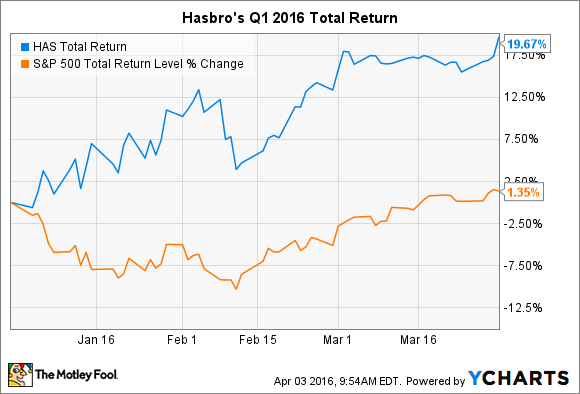 These results, in turn, helped drive Hasbro's stock performance in the first quarter. The popularity of the film surpassed many industry analysts' expectations, providing a more-powerful-than-anticipated tailwind for movie-based merchandise sales. This is surely thanks to Disney's unparalleled marketing acumen. The Force Awakens was the first Star Wars film released under The House of Mouse's ownership, as the company acquired the franchise when it bought Lucasfilm in 2012. Hasbro, however, isn't just a passive beneficiary of Disney's marketing prowess. The company has been executing incredibly well, so it deserves much credit for the spoils. In the fourth quarter, revenue generated by Hasbro's franchise brands grew 6% on a constant-currency basis. (Star Wars' toy sales aren't included in this figure, as Star Wars is a "partner brand.") This result is stronger than it appears because the company had tough year-over-year comparables for several brands. Nerf and Play-Doh continued to be especially strong performers in the quarter. Nerf generated the most revenue of all Hasbro's brands -- franchise and partner -- in 2015. Its revenue expanded 13% year over year, driven by innovations such as Nerf Modulus and Rival, and growth in Zombie Strike and N-Strike Elite. Hasbro continues to do a great job expanding the product lineups of its iconic brands. Pie Face, which Hasbro began distributing in the fall, was a tremendous winner last holiday season. This game involves suspense as to which player is going to get hit in the face with whipped cream. It went viral last year, which prompted Hasbro to acquire the manufacturing and distribution rights from Rocket Games. Pie Face was named toy of the year for 2015 in the U.K. It also clinched the "best board game of 2016" title from the U.S. Toy Industry Association during the 2016 North American International Toy Fair. Pie Face reflects Hasbro's keen eye for spotting potentially huge winners among toys and games and bringing them into its fold. Investors shouldn't count on continual 20% quarterly returns. However, given the significant catalysts for growth in 2016 and beyond, Hasbro's stock could certainly continue to outperform the broader market. Hasbro will continue to profit from its ties with Disney. The two films to complete the trilogy that began with Star Wars: The Force Awakens are scheduled to be released in Dec. 2017 and sometime in 2019. Additionally, Disney plans to release two stand-alone films within the next few years; the first, Rogue One, is scheduled to hit the silver screen this December. A new and likely robust revenue source will kick in when Hasbro reports its first-quarter 2016 results on April 18. On Jan. 1, the global rights to develop dolls based on Disney Princess characters and the immensely popular Frozen transitioned from Mattel to Hasbro. For this reason, Mattel could have a challenging first quarter.